1. Preheat oven to 180C. Grease a 23cm cake tin with removable base and line with baking paper. The bottom will need 1 layer of baking paper, but the sides of the cake tin will need to be doubled with baking paper so the cake doesn't over cook on the sides. Just fold your baking paper in half and line sides. 2. 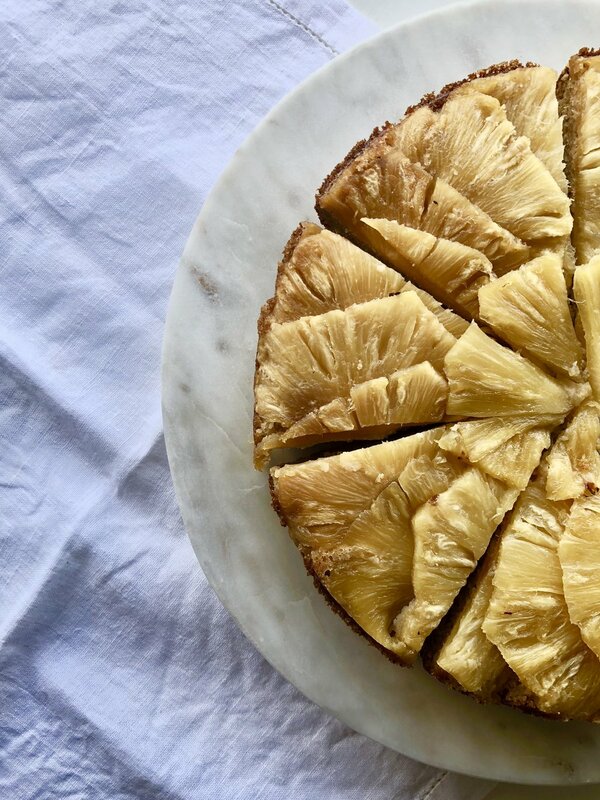 Heat a fry pan to medium/high heat and fry your pineapple slices with the tablespoon of honey (stretch over the two batches), drizzle over the top. Cook for 5 - 8 minutes to brown both sides and set aside. 3. In a large bowl, combine all the dry ingredients and in another bowl combine the egg yolks, coconut milk, honey. Mix the wet mixture into the dry mixture and combine. 4. On the base of the cake tin, layer the pineapple slices in a circular pattern starting on the outside. Slightly overlap each slice. Then do the same for the inner circle. Make sure the base is covered with the pineapple slices. You will have a few slices left over. 5. Using beaters, beat the egg whites until they form soft peaks. Add the egg whites in 3 parts to the cake mixture, folding the egg whites in with a spatular. Once all combined, place on the bottom shelf of oven and cook for 30-35 minutes. At 20 minutes the cake will look brown on top (which will be the base) so carefully pop a piece of foil over the top of cake tin to stop it browning for the last 10 minutes. 6. Leave cake to cool for 10-15 minutes. Release the cake tin at the side and take off. Get your serving platter and place right side down, on top of cake tin. Carefully with one hand on top and one hand under cake tin flip onto serving platter. Gently peel of base and baking paper. Serve with coconut yoghurt and fresh passionfruit or fresh raspberries. Such a treat that you can feel good about eating. Will last you to 4 days in the fridge.